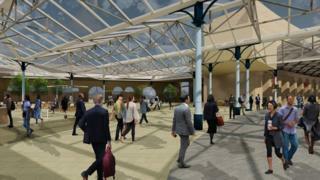 A £5.2m revamp of Newcastle Central Station to cater for millions of expected new passengers has been approved by city councillors. The project will see a new western entrance, short-stay car park and taxi pick-up point as well as a new waiting area for passengers inside the station. Work is due to start later this year, with a completion date set for 2021. The council said passenger numbers were expected to rise from eight million a year now to 12 million by 2023. The council will pay £150,000 towards the initial costs, with £3.3m coming from the North East Local Enterprise Partnership and remaining costs covered by London North Eastern Railway (LNER) and Network Rail, the Labour-controlled authority said. The council said it hoped the redesign would lead to the creation of a multi-storey car park on the nearby Forth Goods Yard by 2023, as well as new homes and offices.